Easter begins with absence. Easter begins with something lost, something missing. And missing things doesn’t tend to bring out the best in us. During the recent Sellwood Bridge construction, after waiting in a half hour long detour backup snaking through the Sellwood neighborhood my husband missed the turnoff for 43 south and ended us up back in Sellwood, at the back of the detour line again. A lesser man might have hailed this mistaken turn of events with one long string of blue profanity, but I can assure you that there was nothing but grace and poise in our car that morning. Most of us have plenty of experience with missing things. We miss birthdays, opportunities and deadlines, we miss the occasional social cue, the more frequent punchline. Missing something dawns suddenly on the mind. It’s that moment you realize you might be on the wrong path. The moment you remember that the anniversary was last week. Whatever you were going about your normal business doing is then suddenly inked over by a frustrated cloud of second-guessing and regret. This is to say nothing of misplacing something. The keys aren’t by the door where they should be when you’re running late. You step off the train and realize that your wallet isn’t with you. It’s enough sometimes to make the whole world feel like it’s barely held together at it’s seams, all the little things we must remember just to get to where we’re going and then one of them slips, lost, into oblivion, and the day becomes undone. Missing people is, of course, the worst, though the disaster of it dawns upon the mind in a similar fashion. One moment you’re fine, and then the next a gesture or a song or a scent draws a line around the empty place where a someone once belonged. Maybe it’s the one you should have never left behind, or the friend who lives too far away. Maybe it’s the spouse or sibling whom death took far too early. Whomever it may be, someone here is missing. Something here is lost. And that’s where Easter begins, with absence. For a group of women heading to the place where the body of their friend awaited further burial, I can only imagine a similar cloud of shock and second guessing blooming darkly out from the moment they first realized that the body they were heading in to tend was missing. What jagged insult was this? First they had endured the sickening, public torture of his body, and now that body couldn’t be found? Had they been mistaken? Had they been robbed? Were they next? And what were they to do? What insult on top of what was already such great injury. For if Jesus was missing now, missing from the one time when they might have actually finally gotten their hands on this man who moved around so much, it was really only typical that he should be as absent from death as he was from life. Jesus had been disappearing from the beginning. Jesus nearly gave his folks a heart attack when we went missing as a boy on their visit to the Temple. He drew a similarly frustrated ire from his best friend Martha when he failed to appear by the side of her brother Lazarus before he passed away. 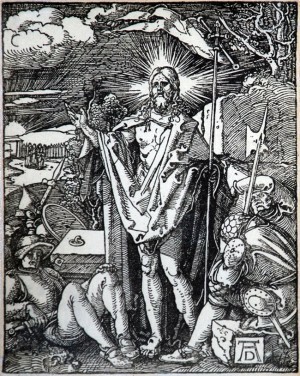 Jesus was constantly disappearing from the crowds who wished to kill him, yes, but also disappearing from his friends and followers, missing from the spotlight to seek some small bit of rest on a hillside somewhere out of reach while hoards filled in the beaches and the synagogues for a glimpse of someone whom they had really only just heard about. For as present as he was to people in his ministry, healing the sick, attending to the folks whom everyone else wanted to ignore, people were always wanting more of him than they had. The crowds were always pressing further in until the moments came when he simply disappeared. “Let me come with you,” one man pleaded with Jesus after he had been cured of many demons. Jesus simply responded by saying, “No. You have to go back home.” It should have been no surprise that Jesus was absent from the tomb. He had told them to expect as much. Easter begins with absence. I learned this poem and this story from Stephen Silha, a local filmmaker in his own right whose most recent work tells the story of Broughton’s life in a documentary called “Big Joy”. And since the day I heard it, the poem will not leave me. It pops up especially when I’m getting frustrated about something not working the way it’s supposed to, something getting lost in translation, or when some minor detail gets missed entirely in the midst of all my preparations. “This is It, this is really It,” the poem chimes, at the most inconvenient moments, “this is all there is, and it’s perfect as it is.” And at first I’m angry about this. This is most certainly not perfect! I can’t find my keys, we missed the exit, our national politics are a joke and our global circumstances are a death wish. There is so much that needs to change, so much that needs to be right with the world, better with the world, better with me, so much of which is missing in me. But the poem keeps insisting that there’s nothing missing. The poem keeps insisting that there is nothing more required in this moment. Nothing more to wait for. Nothing more required to say I’m sorry. Nothing more required to give the man on the street a few minutes of my time. Nothing more required to invite someone seeking sanctuary into our church. Nothing more required to do the right thing, right now, with what we have in front of us. Right when I feel like I simply do not have enough the poem rings: “This is It, this is really It” there’s nothing else to wait for, nothing lacking from this moment, nothing more which will come which will make it any better of a time to love and give and be with one another in as much peace and generosity as can be mustered. This feeling which the poem gives, this sense of staring into the emptiness in front of us and finding that there is more than enough present is the closest thing I can imagine to what happened to the women staring into the emptiness of the tomb. Easter begins with absence, but the closer the disciples get to what is missing, the more they find that something greater is present to them now.